Located just minutes from downtown Hiawassee along GA 288 is the Lake Chatuge Recreation Area. This location is idea for outdoor adventurers looking for a short and low impact hiking trail. The trail is more of a stroll than a hike depending on how slow or fast your feet want to travel. The recreation area is cradled along a southwestern inlet channel of Lake Chatuge. 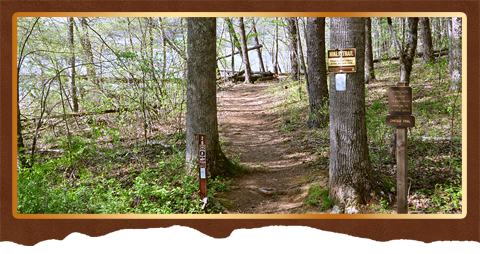 The Lake Chatuge Trail winds thru a wooded shoreline area with various seasonal wildflowers and picturesque views of the beautiful sky blue waters of Lake Chatuge bordered by grand mountains stretching across the horizon. Dogs are welcome though required to be on a leash. Mountain bikes and horseback riding is not permitted. No camping is permitted although there is an excellent boat launch ramp. A large parking area is also available to vehicles and boat trailers.